Remember the New York Times best selling book, “The Five Love Languages?” The book claims if you speak your partner’s love language you will learn the secret to a “love that lasts.” With exciting events and restaurant specials, if bring your sweetie out for a night in Bossier City you are sure to cover any of the five love languages. The quickest way to Marsha Miller’s heart is Bodacious Barbecue in Bossier City. Ever since she moved to Bossier, she quickly developed a fondness for the menu and the convenient location. “I’m a big fan of their botato and their bochos,” Miller said. Bochos are traditional nachos with pulled pork added to the chips. For Valentine’s dessert Miller said she is planning for something non-traditional to celebrate with her husband. For couples who don’t have to entertain the children and are seeking entertainment, do what Brenda Dranguet wants her Valentine to do and purchase tickets to see Corteo. Corteo, part of the Cirque du Soleil touring shows, will perform its opening night in Bossier City at the CenturyLink Center on Valentine’s Day. Tickets start at $59 and are still available for those setting up a last minute Valentine’s date. The show also runs through Feb. 17, in case you have to hold off your Valentine’s date night until the weekend. Since the show starts at 7 p.m. Dranguet said a perfect idea for dinner would be an early meal at 2Johns Steak and Seafood. She said she loves to eat steak and would like to try out the restaurant for the night. 2Johns has been known to offer live performances like the piano man Winston Hall, Drew Ley, Christina Langston, Deidre Malbrough and Chris Allen. Hearing these soft melodies center in the romantic ambiance will make you want to reach for the hand of your sweetie from across the table. Along with entertainment, the restaurant offers some of the best drink specials in Bossier City. 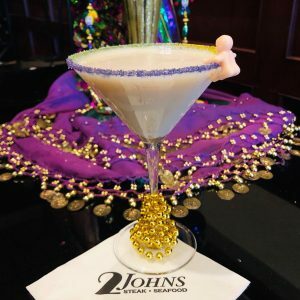 For a seasonal treat, try the Mardi Gras Martini. For those of us who are not a part of a couple, the Valentine’s Dinner for singles Retro 521 might be your best bet. Author JJ Conway will speak on the reality of dating. Conway wrote the book, 40 Dates in 4 Months and has plenty of experiences to share on what a “blessing” the single life can be to many. This event will help you be encouraged and navigate through dating to learn that it is OK to be single. Tickets range from $5 to $100, which included a dinner and a swag bag filled with goodies. If you can’t make the event, at least visit Retro 521 for their special Valentine’s cupcakes. You can also special order these for yourself or that special someone. Valentine’s Night Dance Party and Dinner: 7 p.m. on Feb. 14 at Big Country of Bossier City. Eat a steak dinner for two or just dance the night away listening to some of the best love songs. 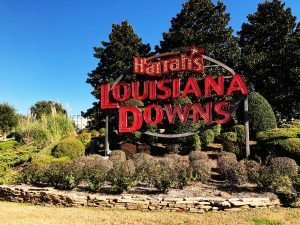 Valentine’s Dinner at Louisiana Downs: 6 p.m. on Feb. 14 at Harrah’s Louisiana Downs. Listen to live music by the Caravan Band and feast on a romantic dinner. The East Bank Cupid Challenge: 6 p.m. on Feb. 14 at the East Bank District. Enjoy food, vendors and a live music competition.